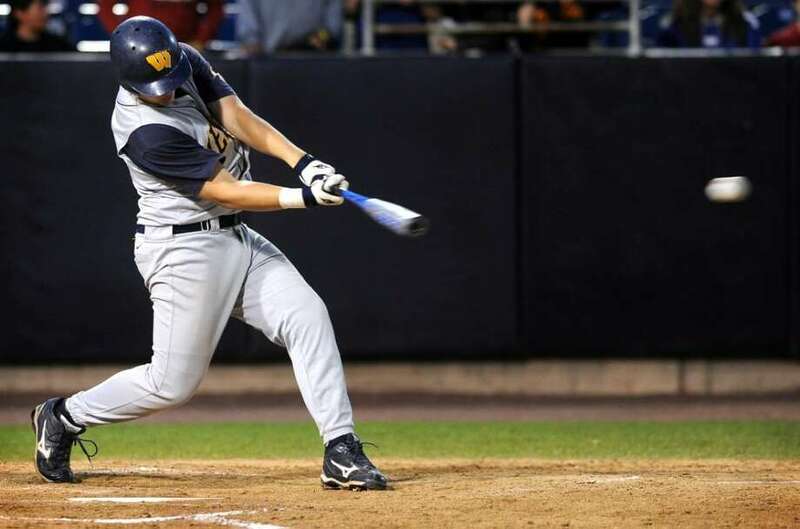 Weston's Drew Clevenger gets a hit during Friday night's game against Newtown at the Arena at Harbor Yard in Bridgeport. After missing the playoffs last year, the Weston baseball team is back in it this year. Weston raised its record to 8-3 and clinched a Class M playoff berth on Friday night with a 6-3 victory over Newtown (7-4) at Harbor Yard. "It was a big win for us," Trojans Coach Frank Fedeli said. "Our bats came around and played well. When we don't give teams extra outs, we do well. We have to keep on playing hard." Weston hit the ball well and finished the game with 10 hits. Weston senior tri-captain Mike McDonald got things started by hitting a two-out home run over the left field fence in the top of the first inning. "I stayed back and I got my hands on the ball," McDonald said. Following McDonald's blast, senior Ben Jaffee (2-3) followed with a single to left. Trojan senior James Jepsen then reached on senior third baseman Colby Brown's two-base error and senior tri-captain Cody Nusbaum made the Nighthawks pay by hitting an RBI single to center field. Nusbaum was a nightmare at the plate to Newtown senior righty Joe Fedak and his two relievers, going 3-4 at the plate. "I was confident and got a feel of where he was throwing and what he was throwing," Nusbaum said. "I trusted my hands, stayed back on the ball and let my instincts do the rest." Ironically, Nusbaum was retired for the only time on what people felt was his hardest hit ball. In the top of the third with two outs and Jaffee, who hit a one-out single on first, the captain slammed a ball deep to the gap in left, but junior Bryan Czel made a diving catch to rob him of an RBI triple (he was close to third and Jaffee crossed the plate when the catch was made). "Right off the bat, I thought it was going out, but the kid made a spectacular play and I tip my cap off to him," Nusbaum said. The righty Nusbaum was even more impressive on the mound. He pitched 5 1/3 innings and gave up three runs on three hits with three walks and six strikeouts. "It all started with confidence," Nusbaum. "I had confidence going into the game and once I was on the mound, I was ready to go. The run support was great and made it easier for me." Although his control was good, the walks Nusbaum issued were costly. In the bottom of the second, he issued a one-out free pass to Czel. Czel, who stole second and following a strikeout, senior Colby Brown singled up the middle to plate Czel and made it 2-1. Junior Drew Clevinger hit a one-out single up the middle and senior tri-captain Peter Krist (2-4) lined a two-out single to left in the top of the fourth but Weston didn't capitalize. In the top of the sixth, the Trojans took advantage of an opportunity. Nusbaum led off with a single up the middle and stole second. Fedeli then inserted senior Zach Forzani as the pinch runner and with one out, Clevinger hit a grounder to the box and Forzani stayed near second. Fedak threw it to second in an attempt to nail Forzani, who got back to the bag in ample time, instead of throwing it to first where he had the sure out, thus both runners were safe. After Fedak retired junior J.J. Lane, Krist banged a two-out triple to center field and made it 4-1. "Going up there, you have to be confident," Krist said. "It was a big spot and we needed those runs. They were huge." Nusbaum walked two batters in the bottom of the sixth with a flyout sandwiched between them. Czel slammed a two-run double to left to close it to 4-3. The righty Lane then relieved Nusbaum and after a wild pitch and a walk, he escaped by striking out the next two batters. Lane didn't give up a hit in 1 2/3 innings and had four strikeouts. The Trojans took advantage of Newtown righty reliever Chris Haylon's wildness in the top of the seventh. Haylon walked three batters in 1/3 inning of work and Nusbaum drove in a run with a single and sophomore Jim Sanzone plated a run with a double. Sophomore righty Kyle Wilcox relieved Haylon and got the final two outs but Weston had a three-run cushion and Lane was lights out on the mound in the final inning. "Cody pitched well, we made the plays when we had to JJ Lane shut them down and was lights out," Fedeli said. McDonald said, "Last year was disappointing not to make states but this year we're more solid and experienced and brought it back."